We’ve recently updated our Employee Engagement System to help our clients fuel engagement with corporate philanthropy programs. CyberGrants is fast to deploy, easy to maintain, mobile-accessible and less of a burden to administrators and program managers. Ready to watch employee participation soar? Take a look at the 5 Fast Facts surrounding @CyberGrants' evolved Employee Engagement System.Tweet This! Ready to watch employee participation soar? Take a look at these 5 fast facts about our updated employee engagement system. CyberGrants Employee Engagement System incorporates its key features into a clean, streamlined interface to provide admins, program managers and employees with an incredible user experience. Its responsive design adapts to desktop, tablet and smartphone screens so users can make an impact on the go. Key features include pre-configured templates, at-a-glance dashboards and smart search tools to support your team’s evolving program needs and goals. A personalized area highlights employee donations, volunteer hours, and goal completion so employees can track their contributions throughout the year. Employees are also encouraged to participate via the gamified experience which grants them badges for their contributions. The search portal makes it easy for employees to find contribution opportunities whether it be for matching gifts, disaster relief, volunteering or more! Events can be searched by type, location, date and charities are easily found in our secure database which employees can even recommend adding the charity of their choice. Signing up and sharing events with coworkers is quick and easy through the mobile app or desktop platform. Check-ins, surveys, photo sharing and connecting to co-workers through social makes participation fun and easy. From matching gifts to volunteering, disaster relief, and everything in between, CyberGrants Employee Engagement adapts to a wide-range of program needs and goals. With role-based access, you can grant program admins to create events, customize portals, approve submissions and more. Our Employee Engagement System’s agility lends itself to the diverse programs and roles that make each organization unique. 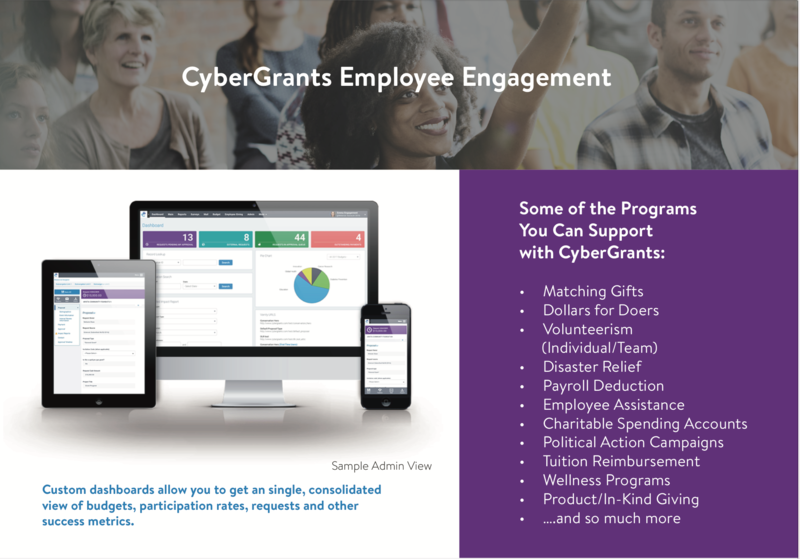 Whether you need an organized dashboard to check regularly or you’re looking to run a customized report to get a better perspective of program success, CyberGrants Employee Engagement is able to deliver insight to program managers to help them strategize and make better decisions. Admins can quickly see budget, requests, spending and participation intel right within the dashboard. The modern workforce is more likely to engaged by opportunities that help them make an impact. 75% of Millennials say they would take a pay cut to work for a responsible company (vs. 55 percent U.S. average), and 88% of Millennials say their job is more fulfilling when they are provided opportunities to make a positive impact on social and environmental issues (vs. 74 percent U.S. average). Providing these opportunities through a system completely aligned with your brand helps reiterate your employer brand to them as they participate. CyberGrants Employee Engagement System is complete configurable, allowing admins and program managers to customize the experience for employees and keep your brand elements, mission, values and goals front and center. From fonts, to colors, backgrounds and imagery, your employees see your brand front and center. It’s as if the software was built by your brand itself! Portlets within the portal are easy to customize from the hero images and messaging you wish to use. Pre-configured templates make it easy to showcase company-wide initiatives so employees will never miss key messaging or opportunities again. These layouts allow program managers to easily update imagery and messaging to capture employees’ attention in a compelling and personalized way. CyberSecurity is a top challenge noted by 61% of Fortune 500 CEOs, according to a Fortune survey. According to Harvard Business Review, businesses are expected to invest more than $93 billion in cyber defenses by 2018. Because of this, we’ve dedicated more resources to protect against cyber attacks. Like implementing a secure system to handle all of your corporate giving transactions within our Employee Engagement System. CyberGrants also utilizes state of the art, end-to-end security measures to protect your data. Our third-party audits continuously improve physical, hardware and database security, data encryption and secure, offsite backup storage. Sensitive information about your employees is safe with our SSAE-compliant systems. Role-based access tightly restricts system access, your data is encrypted while stored as well as in-transit, and PCI compliant methods protect payment card transactions and data. Whether you’re currently using CyberGrants or are looking to make a switch, migration to the Employee Engagement System is simple and easy with the strategic support from our team. Our trusted team works with yours to strategize, plan, build and deploy the system so it’s completely customized to your specific program needs and goals. Download our brochure to learn more about the key features and details of our evolved engagement system.